Just finished a very emotional reading of your book on Reagan and the PATCO " job action " and all that surrounded and surrounds that seminal event in our nations' history. A history still evolving. I would like to say thank you for writing this book. It went a long way forward in explaining the still unknown story about air traffic controllers and their plight to be accepted and recognised by the government and the public. I knew many of the people mentioned in your book personally and some through discussions only at various meetings and functions. Again thank you for bringing controllers to light again. I know you talked with many individuals involved in the history of our profession and its' story but, it appeared that not many rank and file controllers were interviewed. Correct me if I am wrong. 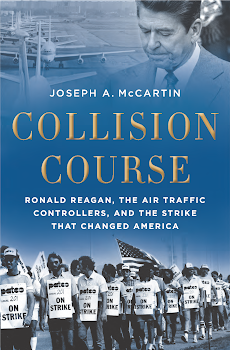 I understand it is a laborious task to write a book but, would you or anyone you know be interested in writing a book that would follow up on your book and cover aspects of what the nonleader air traffic controller went through before, during and after 1981. I do believe we are a part of history and that history is passing away as my brothers and sisters become older. Do you think there is any interest in this history ? The emotional roller coaster I felt from highs and lows brought smiles and tears as I read your book making me realise the pride I feel about being an air traffic controller. It also made me realise that those feeling and emotions, highs and lows, smiles and tears are still very near the surface. I told Dean that the largest single group of people I interviewed for the book were rank-and-file controllers. They constituted roughly half of my total source-base of 100+ interviews. Still, I see his point. I know I was only able to scratch the surface of the many rich experiences that are out there living in the memories of the people who did this work in the years before 1981. I too hope that these stories don't disappear. In America we do too little to preserve the experiences of regular working people. I told Dean that my hope was that this blog can at least provide a forum for some to share their thoughts and memories. If you have anything you'd like to share, please do contact me and I'll post it. Thanks for prodding me on this, Dean.